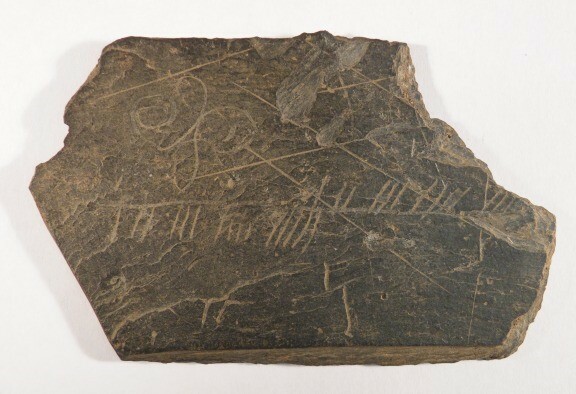 Slate with ogham inscription from Inchmarnock, circa 4th-8th century a.d. Her body fades with her hair becomes invisible her skin is a salmon. Singing eye sings her songs together kine alpine kine grazing. Guarded life is guarded shielded ringed with soldiers. South from our slit ribs bees swarm north. Now is elsewhere jealousy did this. A bower is constructed high in the thorn. Three fires jealousy love and death maggot us. Under no place there are no trees there is no place. Pulse great throbbing blooded heart harts live in her irises. NOTE. Ogham is the script used for inscriptions on stone during the 4th – 8th centuries CE, in the earliest known form of Gaelic. It comprises strokes across or to either side of a central stem line and is found on monoliths mainly in Ireland, with a few in Scotland, mostly in Gaelic but some in conjunction with Pictish symbols, which may be in that language. Its derivation is laid around with various myths: that the alphabet was invented to keep secrets from the Roman conquerors of nearby Britain; that it was similarly invented to keep secrets from the lands that Ireland was later to annex as Dal Riada, the islands and mainland of western Scotland. It’s also said in some quarters that it was handed down by, or named for Ogmos, the Celtic god of eloquence. Ogham is also called the tree alphabet, since the name of a tree (or plant) has been ascribed to each Gaelic letter thus: beith, luis, nin – birch, herb, ash . . . & so on. An alphabet végétal. RAS MacAlister in his Corpus Inscriptionarum Celticarum has transcribed all the stones in Ireland and most in Scotland. His reading is straightforward: he reads into the inscription just name, as for example the stone at Cloghane Carhane in Co Kerry - Eqegni, son (or grandson) of Caratin. He makes the assertion that these are boundary marking stones. The 14th century Book of Ballymote (a collection of origins and genealogies among other things) has an ogham tract (said therein to date from the 7th century CE) in which is given more than 50 ogham types and ways of reading them. In the word-oghams of Morainn Mac Main and Mac Ind Oic, each of these letters is actually a symbol for an entire phrase, a sort of synecdoche with hidden meaning. Thus the Eqegni on the Cloghane Carhane stone would read from Mac Ind Oic: synonym for a friend / force of the man / synonym for a friend / ivy / fight of women / most withered of wood. It would also read, in the tree alphabet as: aspen / apple / aspen / ivy / ash / yew; reading yet differently in the phrase ogham of Morainn Mac Main. Whatever the method of reading this script, it is steeped in the secrecy of the literate over the non literate; it’s always regarded as the property of the high poets, the early medieval fili of Ireland, who would spend many years memorising 150 varieties of ogham. With the above, it’s possible to see the poetic possibilities, whatever ogham script is used. My approach has been to base my ogham poems on readings of the phrase oghams of both Morainn Mac Main and Mac Ind Oic. I’ve also given sideways glances to the tree alphabet. It’s clear from my transliterations that a narrative of a pastoral society is being recorded (or perhaps codified messages in pastoral phrases). The society becomes apparent as close to the earth, a transhumance society, with a keen awareness of landscape and habitat and the trees and plants which inhabit them; part and parcel of the Sweeney stories, the Tain bo Culaigne, the Annals of Ulster. A first and last recorded flowering of a culture and society dating from bronze age Ireland, perhaps much earlier. Because the letters on the inscribed stones are sometimes doubled up, I have used this for emphasis. Because, also, not all words in Gaelic have precise English equivalents (for example seanachas has overtones of biography and of tradition and of genealogy and of history and of language) I have moved between phrase oghams to use words I think best work in a given poem. Where these will not do, I have used other, appropriate translations of the Gaelic, the stone and the landscape itself to make a viable English poem from the ogham.